The books moved in. At the beginning I meant to bring just one box to have the feeling of having something mine into the house and to see how my Ikea white bookshelves would look like with something colourful on the shelves. Then the boxes became two, then three … Then I fell into a book spell. Every book I took from the shelves of my bedroom was accompanied by a oohh, this was nice… I put them carefully into a box or a backpack, a few steps, a few doors, a few meters along our garden path and then back, dusted and neatly arranged in their new place in my white bookshelves. I moved all the books. So far the big move is going well, isn’t it? Moving out and back in all the books was a travel back in time, it made me rediscover all my books written by Irish authors: Joseph O’Connor, Nuala O’Faolain, Roddy Doyle… a few years ago Ireland was one of my greatest passions, I loved losing myself in stories that had as background emerald hills and ballads of violins. I placed the jar with the shells collected in Clew Bay ten years ago on the top shelf and I made a promise to come back as soon as possible … Ireland calls me out loud. Even my cookbooks moved in, and at the moment I feel like a mother with her son far away at the holiday camp. I am here, my cookbooks are there. Will they be fine? Or better, will I make it through the night without them? How will I sleep without a book to leaf through in the dim light under my blankets? Luckily the magazines have not been moved yet. If the move made me brush off my books and my infatuation for Ireland, it also made me rediscover so many cookbooks from which, dear me, I never cooked any single recipe. I guess I am not the only one who thought I can not live without this cookbook, bought it, leafed through it as she was holding the Holy Grail, fell in love with so many recipes and then, how many recipes did she make? Not even one. So, along with the decision to come back to Ireland, I made another resolution: I will make at least one recipe from each cookbook I have to cut back the long list of to-dos that keeps growing. 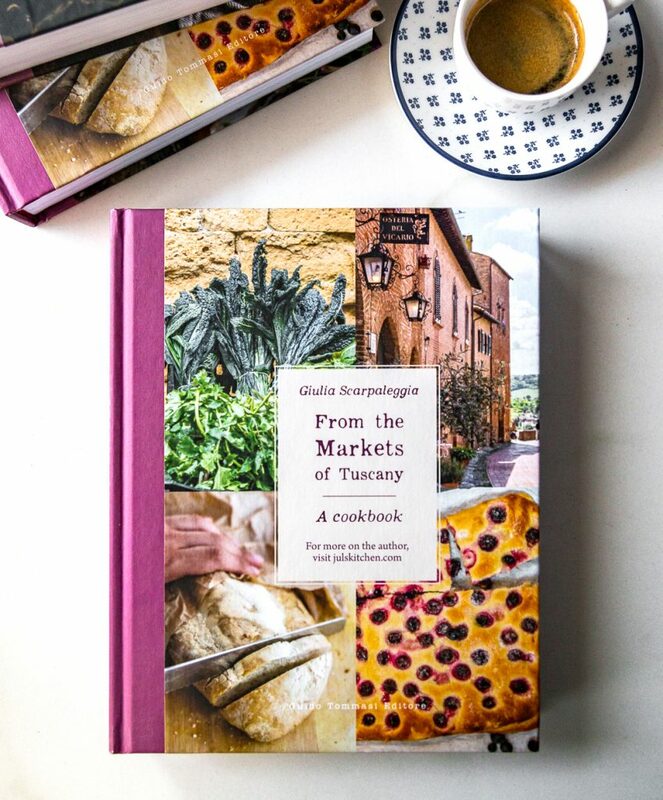 So, ladies and gentlemen, here I am to start my new column, just christened Recipes from my white bookshelves, with an Italian classic, Il Talismano delle Felicità, better known abroad and translated into English as The Talisman, Italian Cook Book by Ada Boni. The original version dates back to the 1929, it was the bible of the perfect housewives until a few years (better say decades) ago: it was usually a gift for the young and unexperienced brides in their wedding day, a good omen for happiness at the table and in the couple. Ada Boni knew all. Ada Boni is a witty woman, she’s a lady from another era, yet her recipes range from traditional Italian dishes to more international ones, clue of a curious approach to cooking. I recognize in her intros Jane Austen’s subtle irony, they have the same way of talking to landladies and young women of marriageable age: light-earthed and fun, though always appropriate. If you want to know more about Ada Boni and her book, check the links at the bottom of this post, now I’ll tell you how Ada Boni saved my lunch on a Thursday morning. This recipe is an ode to the good housekeeping, to those women that are able to bring to the table a dish that fills the eyes and the belly with the few ingredients you can find in your kitchen on a Thursday morning (do you happen to go shopping on Friday afternoons and find your fridge crying in emptiness on Thursdays, right?). As for the bread mentioned in the recipe, you can use stale bread as well, do not throw anything away… remember, I belong to the Tuscan school! Compared to Ada Boni’s recipe I added two teaspoons of strong English mustard, which adds up to the plate a distinctive character. If you want something more delicate, just omit it. Ada Boni suggests to core the carrots leaving them whole, I found it more practical to cut them in half lengthwise and scoop out the middle. Do not throw away the heart of the carrots: use it in salads, to make a vegetable broth or add it to the soup. No waste in the kitchen! In a small bowl combine the breadcrumb soaked in water and squeezed well, the drained tuna, mustard and a chopped sprig of parsley. Mash all the ingredients with a fork and mix thoroughly. Spoon the filling into the carrots and arrange in an ovenproof dish. Mix the tomato puree with the water, a few tablespoons of olive oil and a pinch of salt. 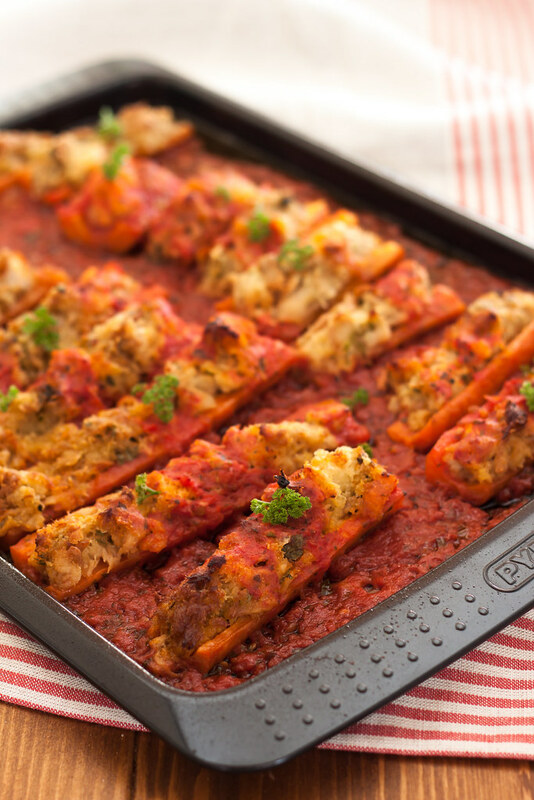 Pour the tomato sauce into the baking dish all around the carrots and drizzle with good extra virgin olive oil. Put in the oven for about 50 minutes, until the carrots are soft and the tomato sauce thick and tasty. Serve the stuffed carrots as a main dish along with a bowl of steamed white rice or fresh bread to mop up the tomato sauce. 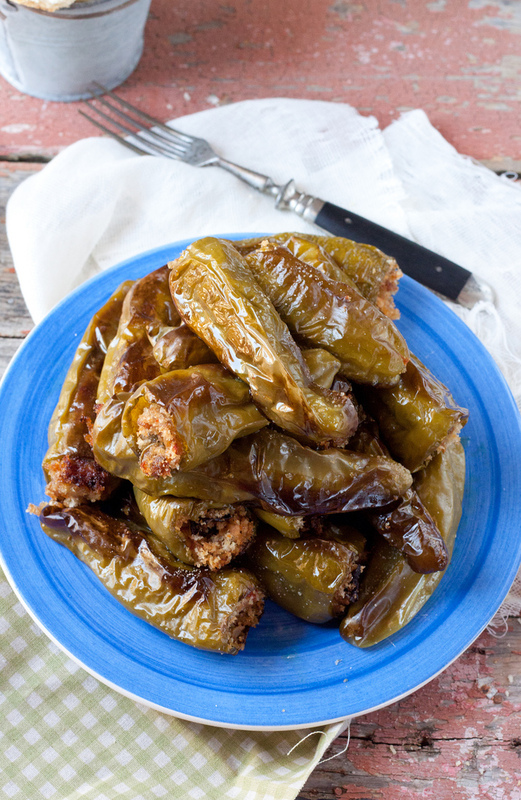 If you have hungry diners these are an excellent side dish to a grilled steak or even boiled meat. 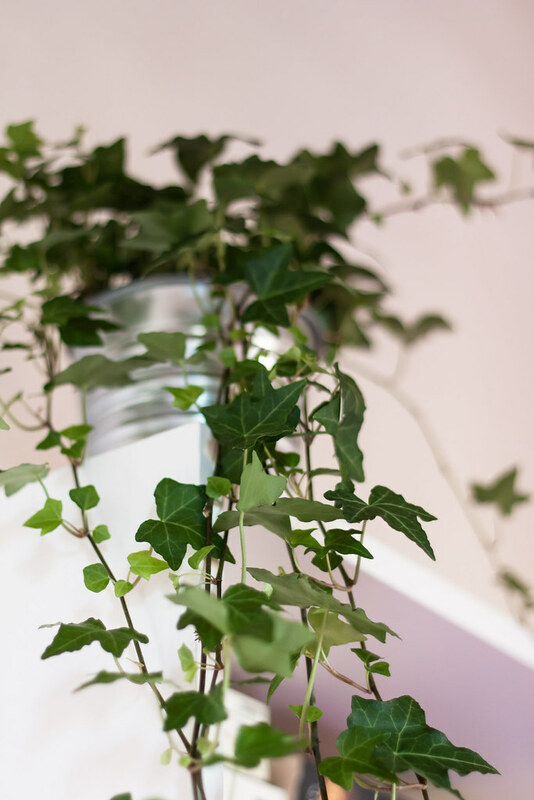 for your note, I found the green ivy at Ikea, now proudly sitting atop my bookshelves. I really enjoyed this article written by Danielle Oteri on how Ada Boni’s Talismano was translated in 1956 into English for American readers: unappetizing literal translations and other funny anecdotes. 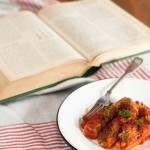 A selection of the most famous Italian cookbooks can be found on LifeInItaly.com. 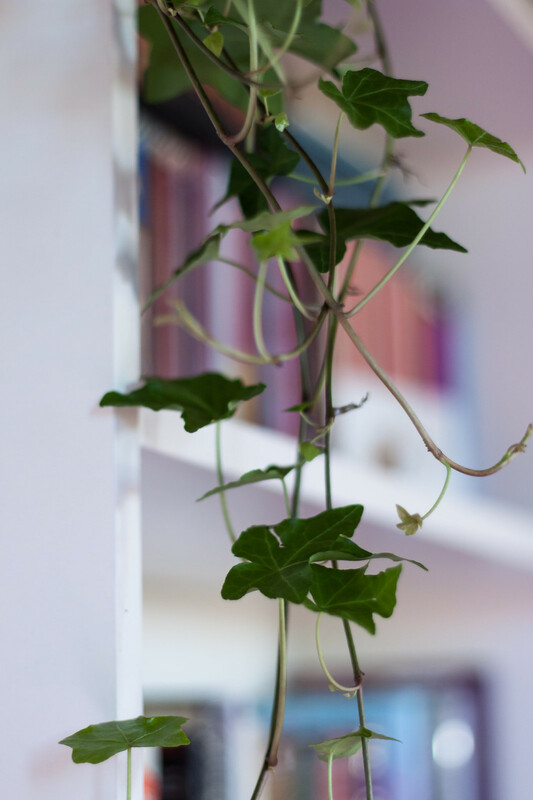 Since we’re talking about books, do not miss Emiko’s latest post What I am reading: you’ll find books to inspire your cooking! 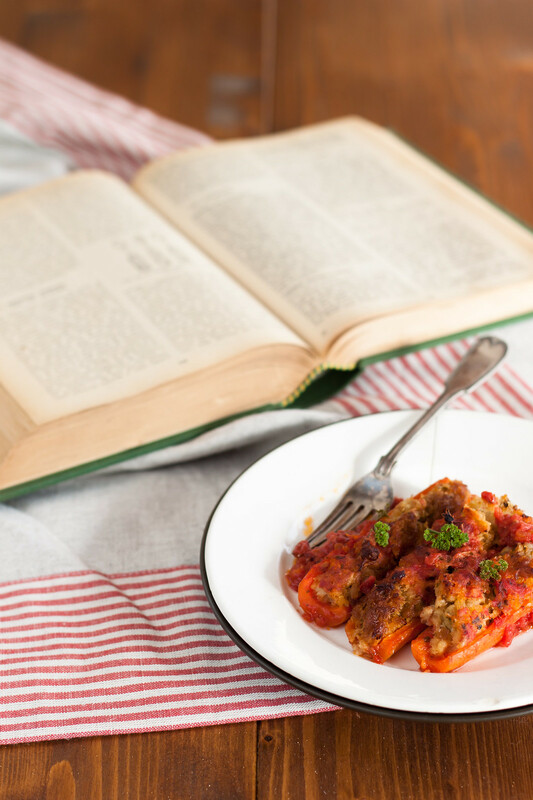 Which is your reference book for Italian cooking? and do you happen to buy cookbooks and then not cook a single recipe from them? Tell me I am not the only one! That is one incredible and original dish! I’ve never seen stuffed carrots before. So so relaxing to find that you are not the only one, ehehehe! My book will be available in a few days, Friday or Monday, I almost cannot believe it! This recipe is so different. I stuff a lot of vegetables but never carrot! This is something to try for sure. So do I! Aubergines especially, then tomatoes, courgettes, peppers, but carrots, never tried them before, and I was so amazed, they were so delicate and good! And, what better.. the stuffed carrots are mouth watering! never heard of them before and now I want to make them already! Will you believe me if I say that I was thinking at you while writing this post, you lucky girl?! Oh, books! There, I’ve said everything… I can never have enough of cookbooks. 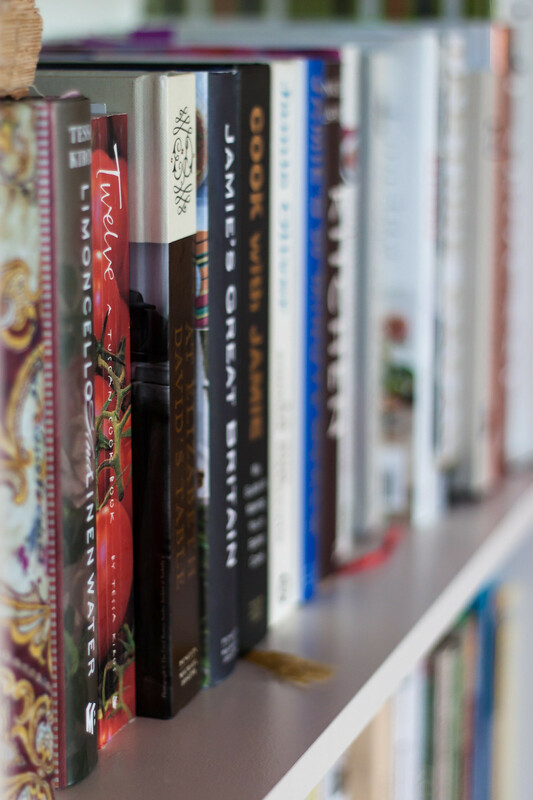 Sometimes I dream I have a cookbook library in my house: big, with floor to ceiling shelf, with books about different cuisines, etymology of food, history, magazines… Well, enough said… 🙂 I am eager to see your book. Will it be available in US? Your stuffed carrots are fantastic and inexpensive meal. Fantastico! That would be a great dream! My book for the moment is available just on line outside Italy, it is possible to buy it online on Amazon.it! My favourite Italian cook book is The Silver Spoon, which I’m slowly working my way through. Home made pasta was a revelation, & much easier than I expected. Same here, I usually stuff aubergines, courgettes, tomatoes, peppers… never tried carrots before! Good idea to do one recipe per month, it’s something you can deal with!